In this men-only class, Dads-to-be learn the ropes and gain valuable knowledge and confidence from veteran dads (and their babies!) who have recently made the transition to fatherhood. 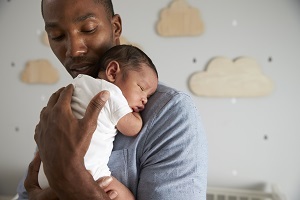 Following the discussion is an interactive session with a Veteran Dad, where there may be opportunity to observe and/or discuss caring for a baby, to include: burping, changing, swaddling, etc. The Veteran Dad will also answer questions the Rookies have (no topic is off limits! ).